Facebook has started rolling out some new Ad Code which is much harder to block, which means the ads may start to get past F.B. Purity’s filters, soon. Never fear! FBP has a new solution for you. While I am trying to figure out a way to hide the ads in the main newsfeed. Try this trick: If you add F.B. Purity to your browser, it adds new items to the “Newsfeed” drop down menu (at the top of the left column of the newsfeed), as shown in the image. If you select “Friends Feed“, you will be taken to a feed that just shows your friends posts, and no posts from “Pages” and no Ads. F.B. Purity also has an option that will try and keep you on that Feed permanently. It works similarly to the “News Sort: Most Recent” option, but with the “News Sort: Friends Feed” option, you first need to select the Friends Feed manually as mentioned to get it to start working. Bonus tip: if you put the text “Suggested Post” (without the quotes) into FBP’s Text Filter box, it should filter out some of the ads on the main newsfeed. F.B. Purity is a safe, free and top rated browser extension that lets you clean up and customize Facebook. If you would like to support the F.B. Purity project and ensure its continuation, please donate what you can. Many thanks to those who do contribute to FBP, your donations are very much appreciated! Please tell all your friends about F.B. Purity too, as I’m sure they will appreciate it too. One way you can help spread the word about FBP, is to go to http://fb.com/fluffbustingpurity and click the “Invite Your Friends To Like this Page” link that appears in the left column, then invite all your friends. For those who don’t know, F.B. Purity is a browser add-on, for Chrome, Firefox, Edge, Safari and Opera that lets you filter out the parts of Facebook you don’t want to see, and also adds extra functionality, such as hiding all the ads, alerting you if friends un-friend you, giving you the options to change the site’s colours, fonts and background image, gives you the option stay on the Most Recent Newsfeed plus lots more. This entry was posted in Facebook, FB Purity and tagged block all facebook ads, block facebook ads, block facebook adverts, block sponsored posts, block suggested posts, clean up facebook, clean up facebook newsfeed, Customize Facebook, Facebook, facebook adblocker, facebook ads, facebook adverts, Facebook Newsfeed, facebook newsfeed filter, facebook purity, FB, FB Purity, fbp news, fluff busting purity, hide ads on facebook, hide all facebook ads, hide all facebooks ads, hide facebook ads, hide facebook adverts, hide sponsored posts, hide suggested posts, remove all facebook ads. Bookmark the permalink. 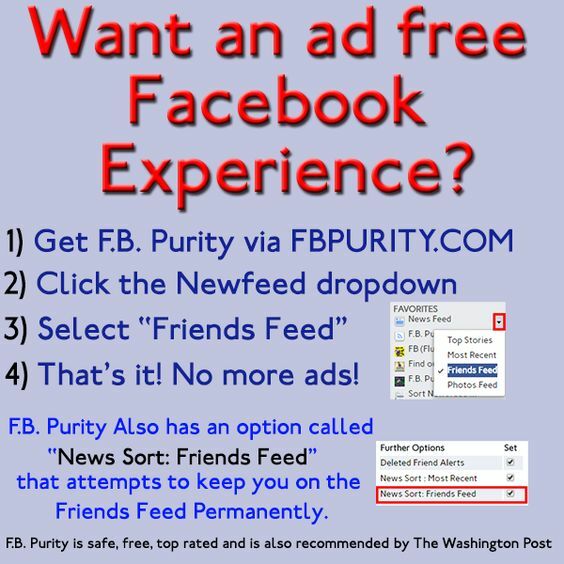 2 Responses to New method for evading Facebook’s ads – Use F.B Purity to view the Friends Feed without any ads! I think I made a mistake trying to get latest version. Now FireFox is sending a message about running 2 versions & blocking pop-ups. Worked fine before. LOVE IT! Please tell me how to fix the problem I’m just a dummy when it comes fixing software problems. You need to uninstall the previous version of FB Purity, Check the FAQ page on FBPURITY.COM for instructions on how to uninstall FBP.